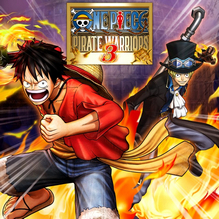 According to a Reddit post on August 1st, 2018 (submitted to the site in a link to PlayStationLifestyle.com), all North American and European versions of One Piece: Pirate Warriors 3 on PlayStation 3 and PlayStation Vita have been delisted. The exact date is uncertain but the game was delisted no later than August 1st. It is still available to download in Japan on both PlayStation 3 and PlayStation Vita. One Piece: Pirate Warriors 3 was only released digitally in North America on PlayStation 3 and PlayStation Vita making these versions extinct in that territory. In European and Asian territories it was released on disc and digitally. The Asian version of the game, linked in the table above, contains English subtitles. “More action, more characters, stronger enemies and an improved gameplay in the latest collaboration between TOEI ANIMATION, KOEI TECMO GAMES and BANDAI NAMCO Entertainment!